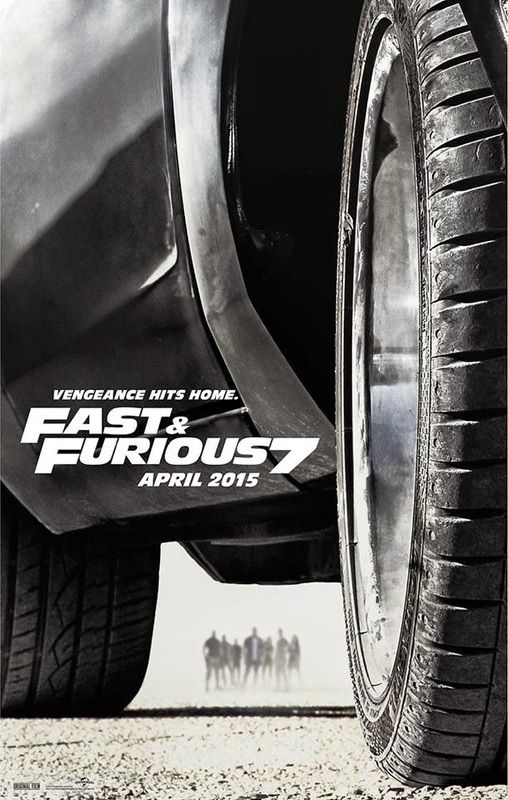 The countdown is on until the first Fast and Furious 7 teaser trailer screeches onto the net. To mark the last seven days before we get some quality footage, Universal is releasing something special each day for fans. So here it is: the first real poster for Fast and Furious 7, thankfully with the 'Fast and' intact after yesterday's banner (below) that only read 'Furious 7'. Seeing as how Fast Five was called Fast Five and most people just referred to the sixth as Fast Six, it would be a bit weird to have to start calling it the 'Furious' franchise suddenly. On the other hand, I suppose the Furious is in keeping with the idea of vengeance which apparently, according to this poster, is about to hit home. Lest we forget, this will be our last chance to see Paul Walker doing his thing in these films. It is only a month until the first anniversary of his death and I'm sure this film will give him a fitting send off. RIP. I'm also hoping for big things from this film as Saw director James Wan took the wheel for this installment. Let's hope he steers the franchise in a thrilling direction with newbies Jason Statham and Kurt Russell on board! Like the posters or had enough of this franchise?